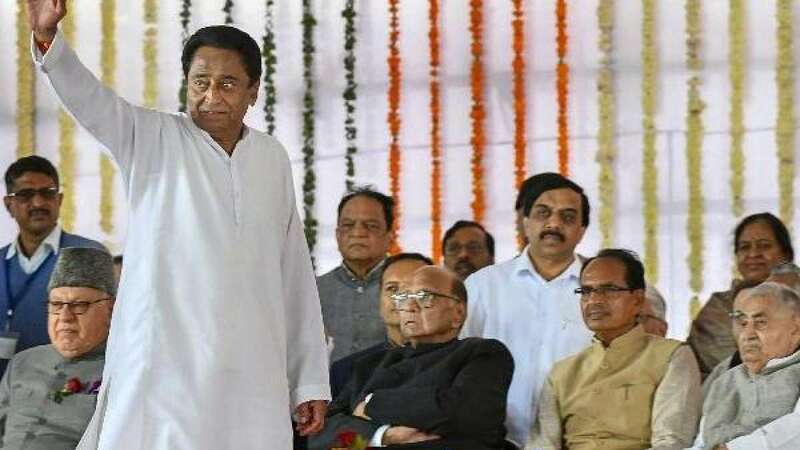 Bhopal : Senior Congress leader Kamal Nath, who steered his party to victory in Madhya Pradesh, was on Monday sworn in as its 18th Chief Minister, bringing to an end 15 years of BJP rule in the state which had become the saffron party's stronghold. The nine-time MP and former union Minister was administered the oath of office and secrecy by Governor Anandiben Patel at a function held at the Jambori Maidan on a day the Delhi High Court convicted Congress leader Sajjan Kumar in the 1984 anti-Sikh riots, triggering demands that Kamal Nath should not be made Chief Minister. The 72-year-old Kamal Nath, who represented Chhindwara for nine terms in the Lok Sabha, was the only one to take the oath even as the other contender to the Chief Minister's post, Jyotiraditya Scindia, was present. The ceremony was held an hour behind schedule at 2.30 p.m. Earlier, Kamal Nath told the media that he had invited West Bengal Chief Minister Mamata Banerjee personally but she expressed her inability because she was occupied with the rituals in connection with her mother's death anniversary. Before the ceremony started, Kamal Nath greeted the leaders on the stage and held Shivraj Singh Chouhan's hand and greeted the people in which Scindia also joined. The scenes were lapped up by the hundreds of Congress activists and supporters gathered there. Representatives of various religions including saffron-clad saints were present at the function. Among them was the 'computer' baba who was offered a Minister of State status by the Chouhan government.